Dogs set the bar of being a trusted friend very high! This entry was posted in Dog Story, Short and sweet, Uncategorized and tagged dog, dog quote, friend, friendship, Man's best friend on March 22, 2018 by roushwm. As I stumbled around my bedroom getting ready for work, I had no clue that inspiration was about to strike. I placed my wife’s coffee on her nightstand as a beeping alarm clock roused her from sleep. Being thoughtful, I shuffled across the floor to her aquarium thinking its light would be easier on sleepy eyes. The instant the tank flooded with light the epiphany came. I felt the need to write about fish. What? I questioned the thought immediately. What does writing about fish swimming in an aquarium have to do with anything other than lowering someone’s blood pressure? Immediately, I concluded two things. The thought had nothing to do with work since I am not a commercial fisherman, nor was it about food, because I don’t normally think of fried fish immediately after breakfast. I left the house confused. I arrived at work and began making my way through the building. Robotically, I turned on a light to illuminate a corridor I had walked down a thousand times. On my left I noticed an expanse of blue paper hanging on the wall. Pasted on the paper was an assortment of hand-colored fish of the sort you would find in a coloring book. I wonder how long it had been there? Another light revealed more fish. Hmmm. I made my way to my desk. Certainly a cup of coffee would help me think more clearly. I retrieved my thermos and a coffee mug I stored in a drawer. Placing both items on my desk, I flicked on the overhead light and sank into my chair, already anticipating the positive effect pouring hot black liquid down my throat would have. As I reached for my cup, I noticed a card lying beside it. Believe it or not, it was a subscription card to the “In-Fisherman” magazine. My immediate thought, you’ve have got to be kidding me. I seemed to have just experienced a three-fold affirmation to write about fish. Since I subscribe to the belief that there is a Divine Being who works in all areas of my life, I resolved to give the subject matter a bit of serious thought. I reflected on what I had to work with. 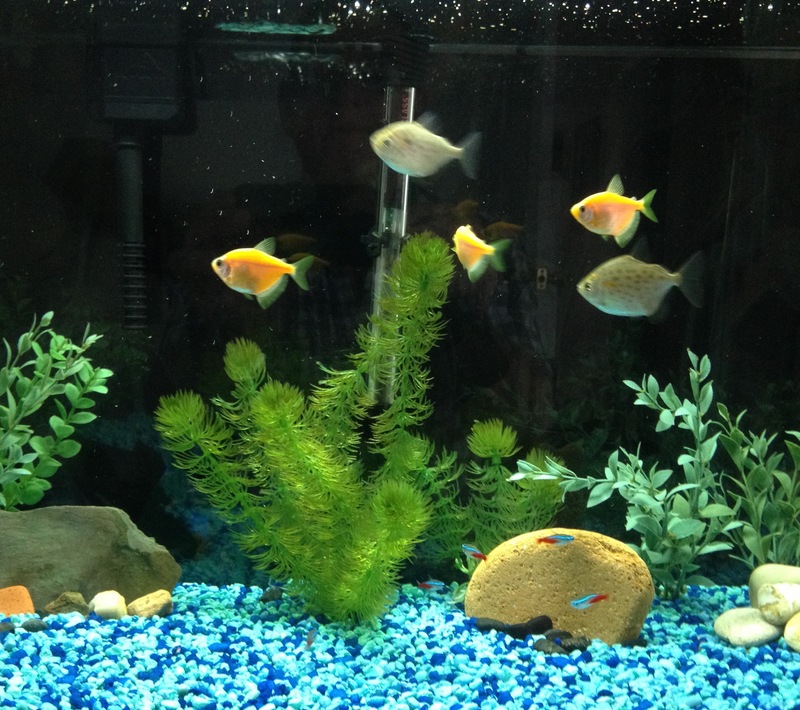 All three instances involved fish-related subject matter already present in the darkness and appeared visibly when I turned on a light. I spent the rest of the morning physically working on maintenance projects while my mind tried to determine what direction to take on this project. I began by tapping into my earliest memories of fish or fishing. Several hours later I had a shirt pocket stuffed full of notes written on paper scraps spanning six decades. I’ll begin with my earliest recollection. During the first ten years or so of my life, going fishing with my dad would definitely make my highlight reel. Our family began taking vacations to Ontario, Canada about that time. Somehow my parents managed to get in touch with a farmer who rented out a pair of cottages on a private lake. My most special memory while staying in one of those cabins involved Dad taking me out fishing early in the morning while my brothers and sister slept. This I imagined equated to having a position of privilege. The expedition began before dawn. We were in the boat as a pre-dawn mist rose up from the tranquil waters. Dad rowed into the mist. The oars creaked as he drew them through the water. This felt to me like an adventure. 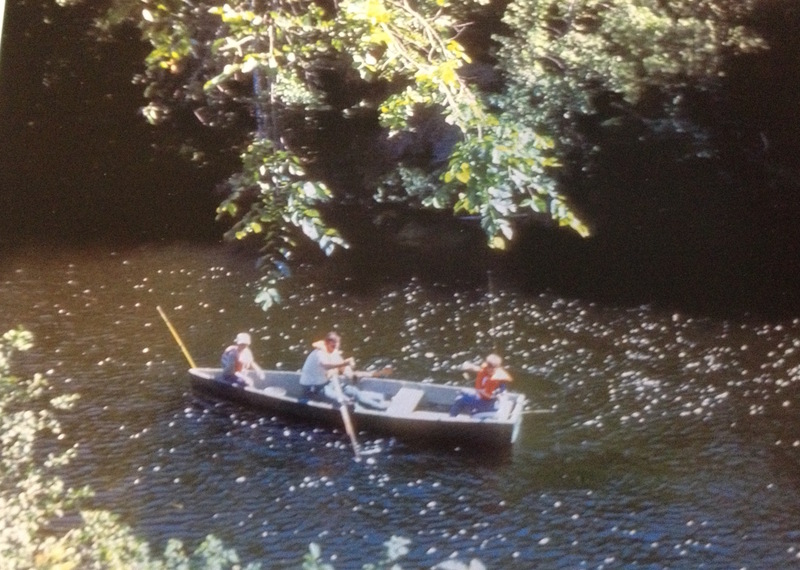 Once my father reached the intended spot we cast our lines in the water. My excitement quickly waned, and the hours began to drag slowly by. No fish were biting. By late morning my stomach was growling. I’d already consumed my peanut butter and jelly sandwich earlier. I remember boredom biting me as I sat in the front bench seat in the nose of the boat. Sometimes the best games grow out of boredom. I decided make a game out of leaning over the side of the boat and trying to get my face as close to the water as possible. My father was oblivious to this folly as he occupied the middle seat and had his back to me. It was hard leaning over the side with a faded orange life-jacket on but somehow I managed it. I decided to add some interest to the game by grabbing the middle of my fishing pole and dangling a lure into the water close to my face. The green rubber frog appeared lifelike as I manipulated it like a marionette. I stared into the dark void as I played. Suddenly, a pair of ghostly eyes emerged from the black depths. A large gaping mouth full of teeth opened, inhaling the frog bobbing on the water. My face was so close to the water that I fell backwards into the boat trying to distance myself from the creature. A mammoth northern pike sunk back into the depths without the slightest splash, my lure still in its mouth. His words did nothing to quell my excitement, as I watched the tip of my pole bend down below the water line. The fish swam away from the boat taking fishing line with it and I could do nothing to stop it. Dad got excited once he saw what was happening. He spun around quickly to face me. “It’s a monster, Dad, I saw it,” I screamed, trembling all over. “Don’t pull to hard, you might snap the line,” he advised. The fish suddenly stopped. My line, now taunt as a guitar string, felt as if it had the anchor tied to it. “Dad, it won’t budge,” I said quickly growing frustrated. My father never attempted to take the fishing pole from me; he instead concentrated on offering me encouragement. He rowed the boat towards the fish to take some of the pressure off the line. We left a cove overrun with lily pads and edged closer to a rocky bank that tumbled into the lake. He stopped rowing when the angle of the fishing line running into the water appeared straight up and down. An occasional heavy tug was the only evidence something was still on my line. The fish and I had reached a stand off. “Billy, the fish may have wrapped himself around something on the bottom,” Dad offered. “Dear God, please don’t let this line break,” I prayed out loud as only a child could. This entry was posted in Devotional, Fishing, Living, Writing and tagged Aquarium, Bible, Canada, childhood memory, Divine being, epiphany, fish, Fishing, fishing with dad, job, life story, symbolism, vacation on March 16, 2018 by roushwm.